Anyone with a family to feed knows it isn’t cheap. But it’s cheaper for some than others. 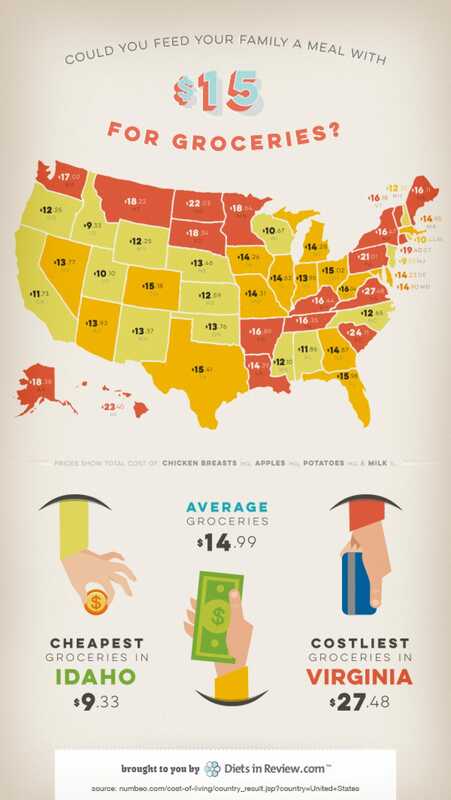 Diets in Review looked at the cost of chicken breasts, potatoes, apples, and milk in all 50 US states using the Numbeo cost of living estimates, to answer the question of whether a family of four could eat a homemade, healthy meal for $US15. The answer: It largely depends on where you live. In the most expensive state, Virginia, it would cost $US27.48 to snag these groceries. In the least expensive state, Idaho, the bill would be $US9.33.